Ginsberg: "I think you'd better speak. You're more eloquent on the subject, and you might not like what I say." Prabhupada: "So, tell about what you're experiencing. And I will also speak. You have Krishna's blessing upon you. You are not an ordinary man." Ginsberg: "But what do you do when different religious groups claim to be the center? Prabhupada: "We don't decry any religion. Our point is love of Godhead. Krishna is love, all-attractive, and we want to be attracted by Krishna, just as iron is attracted to some magnetic force. That is the test of true religion -- how much you have enhanced your love of God. Call Him Krishna or something else. What you call Him doesn't matter." 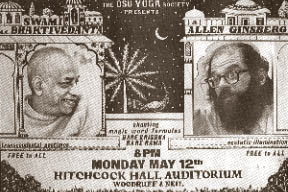 Ginsberg: "I have known Swami Bhaktivedanta for about three years, since he settled in the Lower East Side, New York, which is my neighborhood. It seemed to me like a stroke of great intelligence for him to come, and not as un uptown swami, but as a real down-home street swami, and make it on the street in the Lower East Side, and also open a branch on Frederick Street in San Francisco, right in the center of the Haight-Ashbury neighborhood." Prabhupada: "Om ajnana timirandhasya... I was born in the darkest ignorance, and my spiritual master opened my eyes with the torch of knowledge. I offer my respectful obeisances unto him." "My dear boys and girls. I thank you very much for coming here and participating in this sankirtan function, or, as it is called, sankirtan-yajna, sacrifice. In this kali-yuga age, as poet Ginsberg has explained to you, everything is very degraded from the spiritual point of view. And from the material point of view also, people are reduced in their duration of life, in their merciful tendencies, strength and stature." "When we chant Hare Krishna, our original consciousness, Krishna consciousness and its joyfulness, begins. When we come to the platform of pure, spiritual consciousness, we become joyful, brahmabhuta. This transmigration of the soul, these repeated births and deaths, is a diseased condition of the spirit soul. That you do not know. In our educational system, there is no department of knowledge teaching what the soul is, what is after death or what was before birth. There is no science. It is very lamentable. Education in the name of simply eating, sleeping and mating is not education, not if my bodily condition continues. Because you cannot see it, you are concluding that there is no soul. That is ignorance. There is soul, and this body has developed on that platform. That soul is transmigrating from one body to another, and that is called real, spiritual evolution, and that evolutionary process is going through 8,400,000 species of life." "So, don't commit suicide. Take to this chanting of Hare Krishna mantra, and all real knowledge will be revealed. We are not bluffing you, saying, 'I shall give you some secret mantra and charge you fifty dollars.' No. It is open for everyone. Please take it. That is our request. We are begging you -- don't spoil your life. Please take this mantra and chant it wherever you like. There are no hard and fast rules you have to follow. Wherever and whenever you like, chant, and you'll feel ecstasy." "Just become meek and humble and try to receive the message from authorized sources. You don't have to change your work or conditions. Just hear. Then a day will come when you will be able to conquer the Supreme Lord, who is unconquerable. God is great. Nobody can conquer Him. But if you simply follow this process and try to hear about God from authorized sources, then one day you will be able to conquer the Supreme Lord. As Brahma-Samhita confirms, you cannot find God by merely reading and speculating on sastra, scripture. You have to conquer Him by your love. This is our path -- Krishna consciousness. The path of happiness."